We take pride in every framed fine art print that we sell at FramedArt.com. 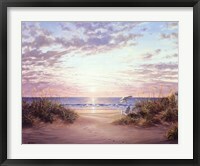 This framed Paradise Sunset print is on a sturdy stock paper and supplied by only the best publishers in the business. Once in our framing department, we'll take excellent care in customizing the frame, mat and glazing options, exactly as you ordered them. Our framed Klaus Strubel prints are a beautiful option for formal living rooms, dining rooms, bedrooms, dens or offices. Not matter where you decide to hang your framed artwork, we're so sure that you'll love it - we're so sure that we back each framed print with a 100% Satisfaction guaranteed policy.